After completing secondary school and receiving his O-level certificate, Mr Mohamed Salleh Ali did not seek higher education. Instead, he took on a job at the fire brigade at the age of 17 to help support his parents and five siblings, who lived in a kampung in Radin Mas. His mother, a housewife who did some needlework to supplement the family income, did not initially approve of such a risky line of work. "When I got the first pay packet, I gave it to her," Mr Salleh, 61, told The Sunday Times. The $239 was "something I earned for my family," he added. In his 44 years with what is now known as the Singapore Civil Defence Force, he has served as a first responder during the construction of the first MRT train tunnels and rescued survivors of the 1986 Hotel New World collapse by digging with his bare hands. The Regimental Sergeant Major at the Civil Defence Academy was among 200 members of the Merdeka Generation - Singaporeans born in the 1950s - who were honoured for their contributions to nation building yesterday. The racial riots that erupted around the time of Singapore's independence in the 1960s were an "eye opener", said Mr Salleh. Speaking about founding Prime Minister Lee Kuan Yew, he began to tear. "I salute him... even though I'm Malay and he's Chinese, he came to the consensus that we are Singaporeans. That's why we have one united Singapore." 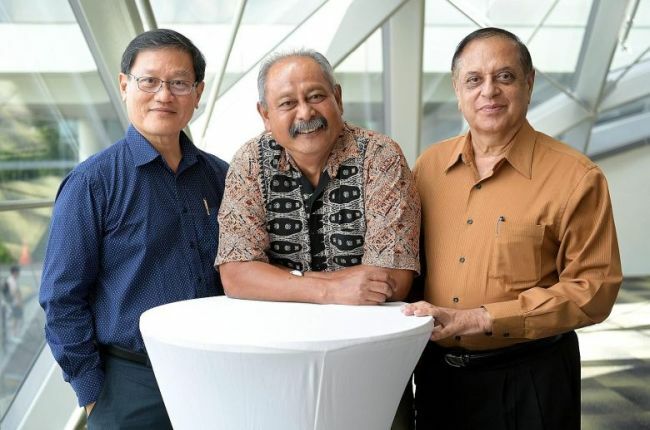 Mr Nijinder Sharma, who was among the earliest fighter pilots in the Singapore Air Defence Command when he joined in 1969, said there was an urgent need at the time to put together a strong defence force for the new nation. "There was no one to hold our hands - we had to develop our own procedures, learn from our own mistakes, and even draft our own doctrines," said Mr Sharma, 68, who now runs a firm that provides support services for private flights. "When we started it was a very different era... I'm very proud to say that the generation at that time had a 'can-do' attitude," he added. Housewife Goh Fang Lui, 64, recalled that her primary school was a basic attap house in a kampung with few amenities. In contrast, students nowadays study in schools that are very well equipped, she noted. "So for future generations, I hope we can encourage them to have the spirit of being able to overcome difficulties and withstand hardship," she said. Mr Eric Wong, 63, said life in the early days was "very basic - we would think only about what we needed on a day-to-day basis." But he fared better than the generation before him due to its sacrifices, "and my children better than me". "Hopefully this goes on and Singapore becomes more successful in future," said Mr Wong, a mediator. The biggest lesson he hopes to pass on to the next generation? "The most important thing is to be resilient, no matter what happens - have a positive outlook for the future."